No way, is Meghan Chase’s reaction to the news. But the truth is undeniable. And now, Meghan must enter a world where anything she touches may kill her—including the icy prince who stirs her wakening senses. As she steps into the Nevernever, finding her brother is only the start of her problems. For the trail leads Meghan toward the most dangerous threat of all, the mysterious Iron Fey.. This is a free Novella from Harlequin Teen, Until July 31st. 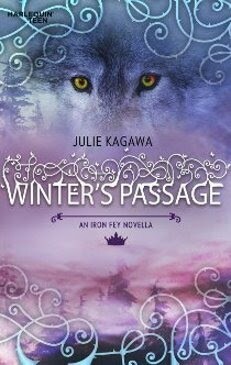 It is a short story inbetween The Iron King and The Iron Daughter. Perfect to wet your appetite before The Iron Daughter comes out in August! It is only about 50 pages, so it is an easy read, but helps to clarify what happens when Prince Ash took Meghan to the Winter Queen, Mab. It is there travel there. A bit of romance, and some action. We get to know a little bit more about the characters in preparation for The Iron Daughter. Good novella. Enjoyable read. I just love me some of that Prince Ash! Yum yum yum! Thanks for posting this. I really want to read it.